While I never spent a whole lot of time on The Miracle Worker, my students were interested in Helen Keller, Anne Sullivan, and the rest of the characters. I usually showed them video of Helen Keller on Youtube, so be sure to find some clips. 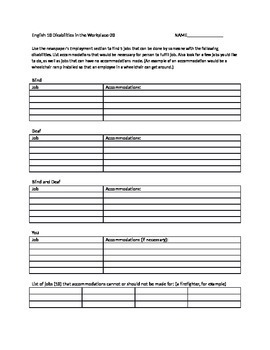 I also created some supplemental assignments that might work for you. I'm not sure why the quiz is 13 questions long, but there is a quiz, and it can be taken on Quizstar. 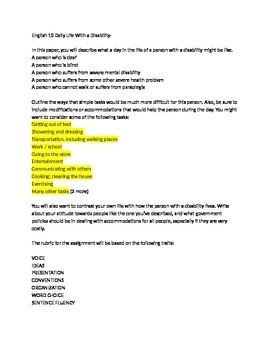 More importantly, I created a writing assignment about imagining a day with a disability, as well as an assignment where students think of how those with disabilities could find employment. 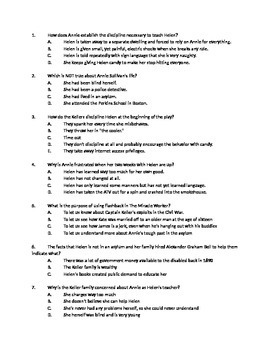 The last part includes several essay questions from a final exam, especially useful if you happen to be teaching To Kill a Mockingbird and/or Antigone along with The Miracle Worker. Some of the question options could be adjusted for other stories, too.